The 35.7 metre motor yacht Crystal II, listed for sale by Rick Weisenberger at Crow’s Nest Yachts, has been sold in an in-house deal. Built in steel by US custom yard Crystal Super Yachts, she was delivered in 2007 as a full displacement yacht. 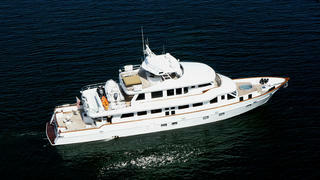 A seaworthy trans-oceanic yacht, Crystal II offers a wide range of amenities for fishing, diving and all water sports. Refitted in 2009, her handcrafted interior accommodates eight guests in a master suite, two double suites and a convertible cabin, all with entertainment centres, flat screen television sets and en suite bathroom facilities. The sky lounge has ample relaxation areas along with a full bar and bar stool seating for two. The entertainment centre includes a 50 inch Panasonic flat screen and DVD/CD with surround sound. There are also Xbox and Wii gaming centres with multiple accessories, and an iPod docking station. Comfortable seating throughout the room includes an oversized leather chair with wooden coffee table to starboard and a queen convertible sofa aft which is easily deployed to accommodate additional guests. The sky lounge can be converted into a VIP suite. She has an expansive cockpit set up for sportfishing, a large flybridge with a fibreglass hard top and also has a Jacuzzi in her bow. Aft on the flybridge is a large king sized sun pad and bolster on a raised frame. Crystal II has a range of 5,000 nautical miles at 10 knots, powered by twin 1,400hp Caterpillar engines. Crystal II was asking $4.4 million.